Gary Petill is convinced that if you’re trying to get kids to eat healthy food, the secret is in the presentation. Petill would know. He’s responsible for serving over 26 million meals a year through the San Diego Unified School District (SDUSD), and has an impressive track record when it comes to pushing produce. The effort doesn’t end at the salad bar. Mondays are meatless. School gardens are thriving. A vibrant farm-to-school program taps into San Diego County’s 350+ organic farms (the most in the nation). Those farms also support the popular “Harvest of the Month” program, through which a locally grown item such as creamy avocados or juicy plums is introduced to students and offered repeatedly throughout each month. An innovative "Breakfast in the Classroom" program reaches 90 percent of eligible children, up from only 25 percent when it began. And the "Prime Time Kids" dinner program currently serves a nutritious evening meal to students at more than 120 sites. Knowing how to launch and maintain a successful nutrition program may help San Diego succeed with its next one. Starting in late October, two dozen San Diego schools are rolling out California Thursdays™, a collaboration with the nonprofit Center for Ecoliteracy. This new program taps into San Diego’s existing commitment to source local produce, but takes it further by offering students a complete meal featuring ingredients from the Golden State. The California Thursdays program is designed to connect the food on the plate to nearby farms and local communities that students know first-hand. Tender local asparagus and just-picked strawberries already come with great flavor; layering in the California Thursdays message teaches students to consider the source of their food and helps emerging healthy habits take root. Preparation for California Thursdays also helped push the school district to hone its definition of "local." 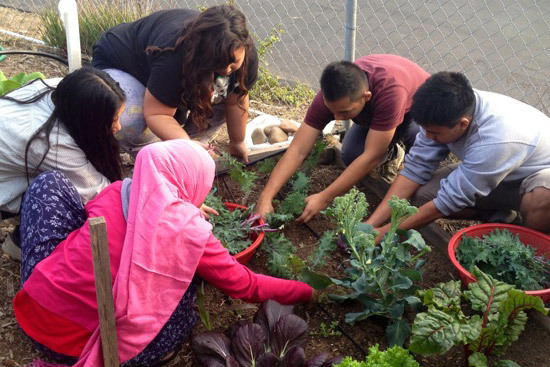 "Being in California, we could always get local produce, but we weren’t always tracking it or establishing relationships with farmers," says Ashley Cassat, SDUSD farm-to-school specialist. "Now we have a San Diego designation for items sourced within 25 miles, a Southern California designation (within 250 miles), and an overall California designation. "In our contracts, we now specify a geographic preference. Not a lot of schools do that." 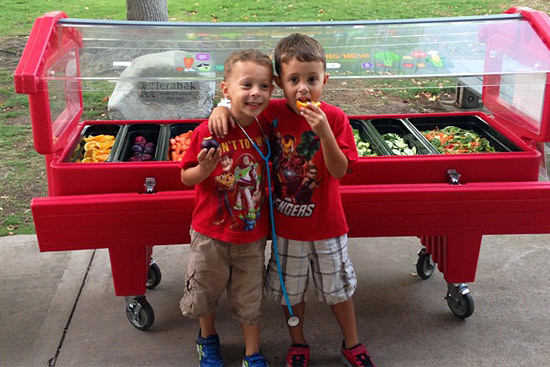 Fresh local produce garners priority status at San Diego Unified School District. The district spends $5 million a year on produce, and up to 25 percent of it is purchased locally. However, getting the message to parents that locally sourced fresh food is available in the lunchroom hasn’t been easy. "We can do the best food in the world, but if parents and students don’t know what we’re doing, we don’t get to serve them," says Petill. California Thursdays may be just the communication vehicle the district needs. "Will California Thursdays help them get the message out? Absolutely," says Adam Kesselman, Rethinking School Lunch program manager for the Center for Ecoliteracy. "San Diego is joining a network of 14 other school districts, including Los Angeles, San Francisco, and Oakland, that together serve 190 million meals a year. San Diego is joining a bigger story — one that’s already attracting media attention, and we’re just starting." Fred Espinosa, food service manager, says that the new California Thursdays program will start with a soft launch, but the school district intends to grow the program robustly. Success will hinge on the ability to get the word out to parents and students and encourage them to give school lunch a try. Espinosa says they’ve been working closely with the Center for Ecoliteracy on refining the messages aimed at parents and kids. "The biggest help is that the Center for Ecoliteracy has turnkey [ready-to-use] solutions for our marketing materials, graphics, and website. That really helps, so we don’t have to reinvent the wheel," he says. It’s help the school district depends on. The message that school food can be both delicious and nutritious needs to be repeated with each incoming class. “Changing the perception of school food is the hardest thing we deal with,” says Petill. "We are one school district that’s not sitting on our hands. We keep pushing forward. Every year, we have new kids and new parents whom we have to educate."